Southern Illinois University Edwardsville extended a personalized welcome to on-campus residents in Prairie, Woodland and Bluff Halls, as well as in Cougar Village, during its annual House Calls event held Tuesday, Aug. 29. University Housing has coordinated the event for 13 years. 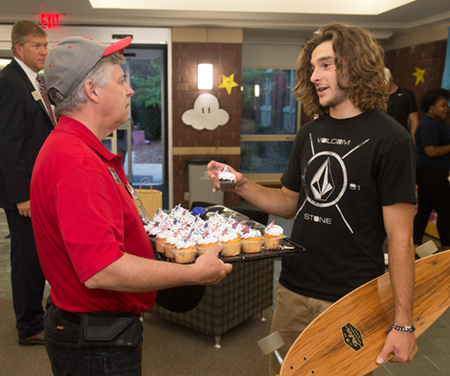 Chancellor Randy Pembrook, Vice Chancellor for Student Affairs Jeffrey Waple and more than 60 other SIUE administrators, faculty and staff participated by handing out sweet treats and engaging with the students. In addition to welcoming students, volunteers also urged them to ask questions in class, get involved and study. A goal of House Calls is to encourage the success of students and empower them to solve problems. Photos: Chancellor Randy Pembrook converses with student Chase Vickery, a psychology major from Taylorville, during the House Calls event. 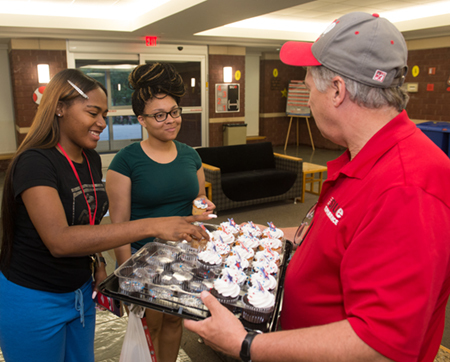 Students Taliah Woodson, of Chicago, and Jayla White, of Springfield, smile as they take a cupcake from Chancellor Randy Pembrook during the House Calls welcome event.